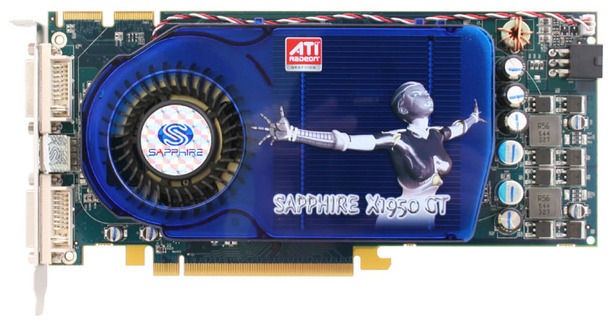 Sapphire Technology has today announced it's latest addition to the Radeon X1950 family of graphics cards. Earlier this month, we revealed that AMD was planning to launch Radeon X1950 GT very soon, but there were no details on when we could expect the announcement to happen. As we reported earlier, the specifications of the card are similar to the Radeon X1950 Pro, as the two use the same 80 nanometre RV570 graphics processing unit. It comes with 36 pixel shader processors, 12 ROPs, 8 vertex shaders, a 256-bit memory interface and support for native CrossFire. Clock speeds are reduced from 575/1380MHz (on the X1950 Pro) to 500MHz for the core and 1200MHz on the memory. VIVO support is dropped and replaced with a standard TV-Out connector, but the card retains support for HDCP over the two dual-link DVI ports. In addition, Sapphire's card will only come with 256MB of GDDR3 memory and there will be no AGP version of the card released. Pricing is expected to be competitive with NVIDIA's GeForce 7900 GS, which sells for as little as £110 including VAT, while the Radeon X1950 Pro sells for around the £130 mark. Seeing as the Radeon X1950 Pro comprehensively beats the GeForce 7900 GS, it makes sense for ATI to release a slightly slower-performing card that competes on price. However, that doesn't help to alleviate the alphabet soup that is the graphics market at the moment. We'll leave you with a shot of the card - you can talk about it in the usual place.